After the Second World War, the extreme right (ER) in Western Europe was associated with the atrocities of the Nazis and their puppet regimes (Rydgren 2005) and was therefore politically isolated and insignificant in most countries of the region. But from the early 1980s on, an unexpected third wave of right-wing extremist party activity swept over the continent. All of a sudden, parties that were dubbed as “extreme”, “radical”, “populist” or “new” right proved highly successful at the polls in countries such as Austria, Belgium, Denmark, France, Italy, Norway, Sweden, and Switzerland. Problems of terminology and idiosyncratic features notwithstanding, a consensus1 emerged that these parties should be grouped into a single party family. While this group of extreme right parties (ERP) is arguably more heterogeneous than other party families (Mudde, 1996), its members are reasonably distinct from the mainstream or established right and share a number of ideological features, in particular their concern about immigration, which swiftly became the single most important issue for these parties (van der Brug and Fennema, 2003). By the 1990s, scholars of electoral behavior had also identified a set of core features of the ERP electorates. While the most successful of these parties have managed to attract some votes from virtually all social groups, the bulk of the extreme right’s support comes from non-traditional segments of the working and lower-middle classes who are worried about the presence of Non-West European immigrants in their respective societies. There is generally a much greater propensity to vote for the ER amongst men, voters who are either young or rather old, those with a low level of formal education and amongst the manual workers, the petty bourgeoisie, and those in routine non-manual employment (see the review in Arzheimer and Carter, 2006, 421-422). This sharp social profile is matched by an equally clear attitudinal profile: as a number of studies have demonstrated, the voters of the West European ER are to a large degree motivated by xenophobic feelings and beliefs (see e.g. van der Brug and Fennema, 2003). A whole host of national and a smaller number of comparative studies have replicated these findings time and again. However, surprisingly little attention has been paid to the more intriguing twin question of why the ER’s support is so unstable within many countries over time, and why these parties are so weak in many West European countries. Only a handful of contributions have looked into this question at all, and each of the existing studies has its shortcomings. Moreover, the findings from different studies often contradict each other. The aim of this article is therefore to employ fresh data and a more adequate modeling strategy in order to provide a more comprehensive and satisfactory answer to the question of why the support for the ER in Western Europe varies so much over time and across countries. The remainder of this article will proceed as follows. After a brief introduction to the main theories of ER voting, the existing longitudinal and comparative studies on the ER vote in Western Europe will be reviewed. Following that, a multi-level model of the ER vote in Western Europe will be presented. The article ends with a discussion of the main findings and their implications for future research. Starting with then contemporary attempts to explain the rise of the Nazi party and the Italian Fascists, social scientist have developed a multitude of theoretical accounts of support for the extreme right. The complexity of these accounts notwithstanding, they can be grouped in four broad strands (Winkler, 1996). A first group of authors focuses on largely stable and very general attributes of the ER’s supporters, namely personality traits and value orientations, that make them more receptive for the ER’s appeals than their compatriots. The most prominent example of this line of research is arguably Adorno et al. (1950). A second strand of the literature is chiefly concerned with social disintegration, which is characterized by a (perceived) break-down of social norms (“anomia”) and intense feelings of anxiety, anger and isolation brought about by social change. Allegedly, this mental state inspires a longing for strong leadership and rigid ideologies that are provided by the ER. A classic example of this approach is Parsons (1942). According to a third class of accounts which draw heavily on theories from the field of social psychology, group conflicts are the root cause of the ER’s successes. This strand of research is, however, rather heterogeneous. At one end of the spectrum, there are classical theories of scapegoating (e.g. Dollard et al., 1939). They argue that (ethnic) minorities provide convenient targets for the aggression of those members of the majority who are frustrated by their lack of status and other resources because these minorities tend to be both different from one’s own reference group and powerless. Otherwise, the choice of the victimized group is largely random and purely driven by emotions. At the other end of the range, theories of Realistic Group Conflict beginning with Sherif and Sherif (1953) emphasize that ethnic conflicts can be driven by a bounded yet instrumental rationality. If xenophobia is the result of a conflict between immigrants and lower class natives over scarce resources (low-paid jobs, welfare benefits), discrimination against immigrants, proliferation of racist stereotypes and support for the ER can be interpreted not as an emotive reaction but rather as part of an instrumental strategy. This idea is especially prominent in more recent accounts (e.g. Esses, Jackson and Armstrong, 1998). Finally, theories of ethnic competition (Bélanger and Pinard, 1991), “status politics” (Lipset and Bendix, 1951) , “subtle”, “modern” or “symbolic” racism (Kinder and Sears, 1981), and social identity (Tajfel et al., 1971) all cover a middle ground between these two poles. While the various labels obviously highlight different aspects of group conflicts, recent research (Pettigrew, 2002) usefully suggests that most if not all of these approaches could be subsumed under the concept of relative deprivation: members of one social group feel that in comparison with another social group, they are not getting what they feel they are entitled to, even if they know that they get more than the other group. Building on previous work by Kriesi et al. (1992) and Tarrow (1996), Arzheimer and Carter (2006) have argued that these contextual factors should be subsumed under the concept of a “political opportunity structure” . Such a structure consists of short-, medium- and long-term contextual variables, which capture the “openness or accessibility of a political system for would-be political entrepreneurs” (Arzheimer and Carter, 2006, 422) and affect the chances (and thereby presumably the motivation) of politicians to create and maintain an electorally viable ERP. However, while the concept of opportunity structures is certainly useful, it is also notoriously vague. As the review in the next section will demonstrate, there is no consensus (yet) on what variables are part of an opportunity structure. On the other hand and somewhat paradoxically, the notion of “opportunity” has implications that might be to restrictive: many context factors like unemployment or immigration will not only provide the political elite with an incentive to mobilize as entailed by the concept but will also have a direct and possibly more important impact on voters’ preferences. Given that comparative data on the perceptions and strategic decisions of (would-be) members of the political elite are unavailable, it is empirically impossible to separate the two potential effects of a contextual variable. More generally, social psychological theories of group conflict were developed and tested in the context of small group research, where psychological and sometimes even physiological processes can be closely monitored, often in an experimental or quasi-experimental setting. Datasets that are available for longitudinal and comparative analyses, on the other hand, are restricted to a handful of attitudinal measures and a set of simple socio-demographic variables that were consistently replicated over the years. This problem is mitigated, however, by the fact that all theoretical accounts of ER support tend to identity a similar set of socio-demographic groups that should be most susceptible to the appeals of the ERPs. Moreover, both national and cross-sectional comparative studies of ER support have confirmed strong and consistent links between these socio-demographic indicators of group membership and more nuanced attitudinal measures. Therefore, although data limitations make is impossible to unpack the details of the underlying psychological process, it is clear that the impact of micro- and macro-level variables on support for the extreme right in Western Europe should be modeled jointly. Only such a multi-level model provides one with unbiased estimates of the contextual effects, because the differences in the socio-demographic and attitudinal composition of the European electorates are controlled for. A multi-level model therefore represents a significant improvement over the existing empirical accounts for the ER’s support, which will be reviewed in the next section. Jackman and Volpert (1996) conducted the first large scale3 quantitative comparative analysis of the ER’s electoral support by estimating a Tobit model of the ERPs’ vote share. Their main findings were that(1) the ER benefits from high unemployment,(2) higher electoral thresholds reduce the support for the ER, and(3) multi-partyism in combination with a proportional electoral system is associated with higher levels of ER voting. Some technical issues notwithstanding (see Golder, 2003a), the analysis by Jackman and Volpert was ground-breaking both in terms of its spatial and its temporal coverage, and yet, there are some obvious substantive problems with it. First, Jackman’s and Volpert’s selection of cases is problematic in at least one instance: They include the Alianza Popular/Partido Popular, which became the major party of the established right in Spain in the 1980s and is not normally considered an ERP (Ignazi, 2003, 190-191). On a related account, their time-frame is problematic since there is now a wide agreement that the “third wave” did not come to itself before the early 1980s, when immigration became the core issue of the ER and many ERP tried adopted new strategies and communication frames that had proved successful in France (Rydgren, 2005). This leads to an obvious problem with the Scandinavian Progress Parties that started out as anti-tax parties in the 1970s and only moved into the ER camp during the early 1980s (Svåsand, 1998). Second, Jackman and Volpert (1996) analyze the impact of a (somewhat limited number of) polity-level variables on aggregate support for the ER but completely ignore the micro-level, which is at the center of all theoretical explanations of ER voting. Finally, by modeling electoral returns, Jackman and Volpert restrict their analysis to a handful of (very important) snapshots in the political histories of the 16 countries. But while election results are decisive for the creation, composition and survival of governments, the ongoing level of support for the ER can have a tremendous impact on proposed and actually implemented policy via the strategic calculations of the established parties, even if the ER is not (yet) represented in parliament (Minkenberg, 2001). For these reasons, Knigge (1998) models aggregate support for ERPs as measured by the bi-annual Eurobarometer surveys in Belgium, France, the Netherlands, West Germany, Denmark, and Italy between 1984 and 1993 in a Time-Series Cross-Sectional design and concludes that immigration and political dissatisfaction correlate with higher levels of support for the ER. Conversely, the effect of unemployment is negative. While Knigge’s contribution is an improvement over the analysis by Jackman and Volpert because she analyses time-series with more and uniformly spaced data-points, it clearly falls short in terms of country-coverage. Moreover, like Jackman and Volpert, Knigge confines herself to the macro-level while a comprehensive model of extreme right support should clearly include both micro- and macro-level factors. Precisely this is the aim of the useful study by Lubbers, Gijsberts and Scheepers (2002), who merge surveys from 16 West European countries with a host of aggregate variables. From a series of multi-level models they conclude that after controlling for individual anti-immigrant attitudes and political dissatisfaction, the number of non-Western residents as well as characteristics of the ERP themselves have a substantial impact on the likelihood of an extreme right vote, whereas the unemployment rate has no significant effect. However, their contribution is problematic, too, in a number of ways. First, the merging of data from six national election studies with data sets from three different supra-national projects obviously raises problems of validity and reliability. Second, the number of N = 17 level-two units is too low for multi-level modeling by any conventional standard, especially given the authors’ interest in estimating variance components (Hox, 2002, 173-179). Finally, they focus on a rather brief time period, thereby excluding the 1980s (when the ER became a relevant political actor for the first time in decades) and much of the 1990s. Moreover, unlike Jackman and Volpert and Knigge, Lubbers, Gijsberts and Scheepers discard any cross-temporal variation in the ER’s support by pooling surveys from different years. This is certainly not a problem in the analysis presented by Golder (2003b), which proceeds along similar lines like that of Jackman and Volpert but covers 19 West European countries including many “failed cases” like Iceland, Ireland, or Malta, and 165 elections between 1970 and 2000. From his findings, Golder concludes that(1) the ER benefits from both high levels of unemployment and high levels of immigration, and that(2) there is an additional positive interaction between unemployment and immigration.. Although Golder’s results are suggestive, like the other aggregate analyses they do not allow one to draw conclusions about micro-level processes, e.g. about the propensity and the motivation of the unemployed to vote for the ER. Technical sophistication notwithstanding, most of the problems discussed in regard with Jackman and Volpert and Knigge therefore apply to Golder’s study as well. While all studies discussed so far have addressed unemployment as one potential determinant of ER support, Swank and Betz (2003) were the first who empirically analyzed the the mediating effects of welfare state institutions on the ER vote. In yet another macro model, they regress the electoral returns of the ER in 83 elections that were held between 1981 and 1998 in 16 West European countries on trade openness, capital mobility and foreign immigration as well as on the level of social protection and a number of other contextual variables. From their findings, they conclude that the number of asylum seekers is positively related to ERP success, whereas a high level of welfare state protection reduces the appeal of the ER. However, although the impact of unemployment is at the center of the debate, Swank and Betz (2003, 228) use a fairly general index of welfare state benefits. While their approach is innovative, this variable is clearly not ideal for their purpose. Moreover, all concerns regarding the aggregate analyses by Jackman and Volpert, Knigge, and Golder obviously apply here, too. Finally, in the most recent contribution to the field, Arzheimer and Carter (2006) have tried to overcome some of the limitations of the existing research by merging data from 24 national election surveys (conducted in seven countries between 1984 and 2001) with a host of aggregate-level information such as party-positions, proportionality of the electoral system, unemployment, and immigration figures. 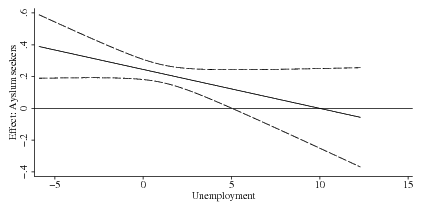 Like Knigge, they find a negative effect of aggregate unemployment. Moreover, they conclude that established right-wing parties that take a very tough stand on immigration may actually legitimize the policies of the ER, and that grand coalition government prior to elections raises the odds of an ER vote being cast. However, Arzheimer’s and Carter’s paper is not without problems, too. First, while their mode of analysis is less demanding on the data than multi-level modeling, the parsimony of their model comes at a price as they have to assume that no unit (=country) effects remain after controlling for the impact of the aggregate variables. If this assumption does not hold, bias will result. Second, unlike Knigge and Lubbers, Gijsberts and Scheepers, they do not measure support for the ER between elections. Third, since they rely on national election studies that vary wildly in terms of attitudes questions asked, their range of individual-level variables is restricted to “objective” features like age, class, and education. Fourth, the number of level-2 units (elections) is rather low in relation to the large number of contextual variables in which they are interested. To summarize, the existing research has demonstrated that contextual factors (and most prominently immigration and unemployment) have a systematic effect on support for the ER in Western Europe. However, while models of ethnic competition (that are consistent with micro-level theories of support for the ER) strongly suggest that immigration, unemployment, and their interaction should all have positive effects, it is unclear whether and under what conditions this is true. Moreover, it is by no means obvious that unemployment and immigration are truly more important than other contextual factors. While a lot of progress has been made since the paper by Jackman and Volpert was published, the previous section has shown that none of the existing studies on the contextual determinants of the extreme right’s vote is entirely satisfactory. The analysis presented here tries to overcome these limitations by(1) combining a relatively large number of relevant system-level variables with individual socio-demographic and attitudinal data that are measured in a comparable fashion,(2) covering the whole time-span between 1980 and 2002, and(3) not excluding contexts where the ER is very weak. At the micro-level, the model includes information on the respondents’ gender, age, level of education, and social class. The gender gap in support for the ER is well known, even if its causes are controversial (Gidengil et al., 2005). The other socio-demographic indicators reflect the theoretical and empirical links between group membership, attitudes and the likelihood of a vote for the ER. For instance, it is well known that voters with high levels of educational attainment are more likely to embrace liberal values (Weakliem, 2002) and have little reason to feel threatened by low-skilled immigrants. Younger voters, members of Europe’s declining “petty bourgeoisie”, manual workers, the unemployed and maybe pensioners, on the other hand, should be highly susceptible to the appeal of the ER because they compete with immigrants for scarce resources. Three measures model the impact of ideologies and more specific political preferences. First, while longitudinal data on immigration attitudes are largely unavailable, in most countries the ER has taken a negative stance on European Integration and has tried to link this theme to its core issues of immigration, national sovereignty, and law and order. Therefore, the model contains a control for Euroscepticism. Second, the notion of a “protest vote” features prominently in some of the earlier accounts of the “third wave”. It is, however, unclear what a protest vote should entail. On the one hand, some authors suggest that “protest” is something irrational and emotional that is unconnected to values and ideologies and primarily “a vote against things” (Mayer and Perrineau, 1992, 134). But on the other hand, it is obvious that much of this “protest” is not un-ideological at all but clearly directed “against the policy or the absence of policy in this respect [migrants and law and order]” (Swyngedouw, 2001, 218-219). To account for these “protest motives”, the model contains both an indicator for general political dissatisfaction as well as a control for political ideology (the familiar left-right self-placement scale). This makes it possible to separate the alleged “pure protest” from ideology- and policy-based considerations. Moreover, controlling for ideology accounts for the fact that the political left can benefit from Euroscepticism, too. Most national and comparative studies of the ER vote have demonstrated rather stable and uniform effects for these individual-level variables. The crucial question here is whether these regularities do still hold once contextual variables are included and the spatial and temporal coverage is extended beyond that of previous analyses. At the macro-level, the model aims at bringing together the most relevant variables from the contributions discussed above without taking a shotgun approach that would render both estimation and interpretation infeasible. Given their prominence in the literature and the fact that ethnic competition theories provide a clear rationale for the interpretation of their effects, the inclusion of unemployment and immigration plus an interaction between both figures is a matter of course. The “protective” effect of welfare state benefits found by Swank and Betz (2003) deserves closer inspection,too, not least because it has clear implications for public policy. Moreover, the findings by Swank and Betz contravene one particularly influential early account of the ER’s support in Western Europe: Kitschelt’s (1995) hypothesis that a combination of authoritarian and market-liberal stands would guarantee electoral success for the ER. However, in line with the argument about ethnic competition in the labor market, instead of the general benefit data a more specific measure of benefits for the unemployed will be used. Following Arzheimer’s and Carter’s approach, two institutional features that most clearly embody the concept of a (durable) opportunity structure, namely political decentralization and the degree of disproportionality of the electoral system are included, too. In the case of decentralization, Arzheimer and Carter present arguments both for a positive and a negative relationship with the ER vote. On the one hand, subnational elections can work as a “safety valve” for dissatisfied citizens that would ceteris paribus reduce support for the ER in national elections. On the other hand, these second-order elections provide the ER with opportunities for acquiring political experience, access to the media, and credibility. While neither of these two effects is borne out in their original analysis, disproportionality is of particular interest because the existing research seems to disproves the common wisdom that less proportional systems help to “keep the rascals out”. Finally, Lubbers, Gijsberts and Scheepers as well as Arzheimer and Carter have argued that a comprehensive model of ER voting should also reflect the impact of genuinely political short-term factors such as the political agenda, the general tenor of the political debate on the issues of the ER, and the ideological positions of the political parties in a given country at a given time. While both groups of authors use a somewhat idiosyncratic terminology, their two competing hypotheses can easily be re-expressed within the framework of well-established theories of political behavior. On the one hand, classical theories of spatial competition (cf. Enelow and Hinich, 1984) which treat the distribution of preferences in the electorate as exogenous and fixed in the medium run suggest that the rise of ER in the 1980s can be explained by the mainstream parties’ persistent reluctance to cater to the existing demand for strict immigration and asylum policies. Consequentially, support for the ER must decline if the established parties (with their track record of past performance in government and their much broader appeal) take a tougher stand on immigration and multi-culturalism, thereby “stealing” the ER’s issues. As Bale (2003, 76) observes, this “conspiracy of silence” theory of ER electoral successes is rather popular with political pundits in many West European countries. On the other hand, a more subtle claim is often made in the literature on the extreme right: if a mainstream party takes a radical position on the extreme right’s issues, the public can interpret this as a signal that these policies are relevant, and that the contents and style of extreme right politics are no longer taboo (see e.g. Thränhardt 1995). As a consequence, at least some of the voters who support the ER’s policies but shy away from voting for a stigmatized party will now, in Jean-Marie Le Pen’s words, “prefer the original to the copy”. Moreover, other voters who were previously not aware of these issues may now be induced to evaluate the parties with respect to this policy dimension. To gauge the potential effects of party competition, Lubbers, Gijsberts and Scheepers (2002) rely on an expert survey, from which the derive two measures that capture the “immigration restriction climate” and the available “space for the ER”. Arzheimer and Carter (2006) draw on the Comparative Manifesto Dataset. Using party statements on internationalism, multi-culturalism, national lifestyle, and law and order, they construct two variables, namely the ideological position of the major party of the ER and the ideological distance between the two major mainstream parties. The latter approach seems preferable, because unlike the expert survey, the manifesto data are inherently dynamic, based on a well-defined and reliable coding procedure, easily available for replication, and cover the whole period under study. However, to further improve on Arzheimer and Carter and to link the empirical analysis more closely to the underlying theories, the construction of both variables was slightly modified. First, considering only the ideological position of the major moderate right party seems overly restrictive. Often, the margin of what is politically acceptable will in fact be defined by the position of a smaller party of the right (or left, see Thränhardt 1995, 328 on anti-immigrant measures taken by Communist mayors in France).4 Consequentially, the most radical position on the ER’s issues taken by an electorally relevant party that is not part of the ER (cf note 11) is used as an indicator for electoral competition. This approach has the additional benefit of avoiding somewhat arbitrary decisions about what constitutes the “major” party amongst a whole group of more or less equal-sized political groupings. To summarize, if standard spatial theories of voting apply, support for the ER will ceteris paribus be lower where the established parties position themselves further to the right. If, however, theories of agenda setting and priming prevail, the extreme right should benefit if their issues(1) feature prominently in elite discourses directed at voters and(2) if there is little consensus about what should be done. On the other hand, if elites downplay these issues and if there is little conflict amongst elites, this should reduce support for the ER. Consequentially, the “conspiracy of silence” could be a viable political strategy. Finally, two caveats are in order. First, the phrase “no longer taboo” suggest that the timing of manifesto statements can have a crucial effect: once a taboo is broken, it could be difficult if not impossible to restore it. In principle, one could classify countries according to(1) whether the established parties have ever adopted the issues of the ER and(2) if so, whether they have returned to their original position, and introduce this classification as an additional variable. But since the number of West European countries is low, in reality it is infeasible to model this effect of timing. Second, the model does not contain any measures for another important class of short-term factors, namely the content of the mainstream-media. However, while the media will most probably haven some effect even when party positions are controlled for (see Boomgaarden and Vliegenthart 2007 for a single-country study that tests this proposition), relying solely on party manifestos can actually be an advantage since it could be argued that political messages sent by other parties could to a degree reflect anticipations about future and reactions to previous successes of the ER, which would in turn lead to endogeneity bias. While this argument may apply to the statements that parties and politicians issue on a daily basis, endogeneity is less likely to be a problem with party manifestos, manifestos are the outcome of a lengthy deliberation process within the respective party. Moreover, unlike individual statements, the commit they represent a public policy commitment. Therefore, manifestos are probably the best and most reliable measure for a party’s position and political message. The analysis covers the member states of the European Union (EU) as it existed before the Eastern enlargement rounds plus Norway.6 Individual level data come from the European Commission’s bi-annual series of Eurobarometer surveys.7 The number of missing values in the Eurobarometer for the variables under study is rather low, yet listwise deletion of cases with missing information reduces the sample size by about one third and can lead to overly optimistic standard errors and biased estimates. As a safeguard, the Multivariate Imputation by Chained Equations procedure devised by van Buuren and Oudshoorn (1999) was used to create eleven imputed data sets. All analyses were carried out both on the original and the completed data sets, but the results are almost identical. Contextual information was drawn from official election results, OECD databases and printed reports (OECD, 1992, 1999, 2001, 2002, 2003, 2004), the datasets produced by the Comparative Manifesto Project (Klingemann et al., 2006), the UNHCR statistical yearbook (UNHCR, 2002), and Lijphart’s (1999) seminal study of institutional arrangements in Western democracies. While Golder (2003b) is right that excluding these “failed cases” is likely to lead to biased estimates in studies where aggregated electoral support is modeled, the case is less straightforward in a setup where individual voting intentions are analyzed. In countries where the ER is very weak, strong effects of social desirability are likely to bias the measurement of ER support. Moreover, supporters of the ER are often prevented from voting for their preferred party because the ERPs will not field candidates in most constituencies.10 Finally, due to financial constraints of the pollsters, the supporters of tiny ERPs are often coded as voting for “other” parties. As a result, support for the ER will be underestimated in contexts where those parties are already very weak, which will lead to a different kind of bias. While there is no perfect solution for this dilemma, restricting the analysis to contexts where it is at all possible to trace support for the ER by means of mass opinion surveys is a reasonable compromise. The remaining surveys provide an exceptionally good coverage of the “third wave”, including the early successes and failures in the 1980s. The only major gaps are Norway in the 1980s and late 1990s (when the country was not yet/not any longer covered by the Eurobarometer) and Austria between 1986 (when Haider became chairman of the FP”O) and 1994 (when Eurobarometer polling started). The dependent variable is vote intention for an ERP,11 calling for logit or probit multi-level analysis because the observations in the dataset are obviously nested. However, the way in which this nesting should be modeled is less obvious. Observations could be conceived of as (1) persons nested in countries nested in time, (2) persons nested in time nested in countries, or (3) persons, cross-classified by time and countries. Of these, (2) is the most appropriate variant for a number of reasons. First, a cross-classification would be structurally incomplete, because a number of country-years are not covered by the Eurobarometer or were excluded because there were no ER voters. Second, persistent effects unit (country) effects are quite strong, whereas there is no indication of any effects of time that would be uniform across countries. Finally, while time-points are random in the sense that they can be conceived of as a sample from a large universe of days/weeks on which a survey could have been conducted, countries are not sampled from a population but are essentially “fixed” (Berk, Western and Weiss, 1995). c14), and a random disturbance at the context level (u0j).13 The latter is assumed to be normally, identically and independently distributed (?? ).14 Since the structure of the model is logistic, the binomial distribution of the vote intentions is assumed to adequately account for randomness at the individual level. All models were estimated in MLwiN 2.02 using the Penalized Quasi-Likelihood method based on a second-order Taylor expansion (PQL2). Estimates for the four components of the model are presented in table 1. The rows in the lower third of the table contain the unit effects for the 14 countries under study, i.e. the logit of an ER vote when all individual and contextual variables are set to zero.15 While the coefficients themselves are of little intrinsic interest, their huge variation implies that even if a whole host of individual and contextual variables are controlled for, there are persistent differences between these countries that must be due to other, durable factors. The effects of the individual-level variables can be discerned from the topmost panel of table 1. As it turns out, the expected patterns re-appear even when one controls for contextual variables, unit effects and contextual variance. In line with theoretical expectations, groups who compete with immigrants for scarce resources and who have exhibited the highest level of xenophobia in the past – manual workers, younger voters, and the unemployed – show significantly more support for the ER than other groups. The gender gap is equally prominent. While the logistic link implies that effects are not linear-additive and that the proportion of ER support depends on the level of all independent variables, membership in either of these socio-demographic groups roughly doubles the probability of an ER vote.17 Again in line with previous findings, holding a university degree massively reduces the probability of a vote for an ERP, whereas being a pensioner has no significant effect on the vote. Turning to the attitudinal variables, being a eurosceptic18 more than doubles the probability of an extreme right vote, but political dissatisfaction and ideology have even stronger effects. Dissatisfaction is operationalized through a four-point rating scale, therefore its maximal impact on the logit is 1.7 points. Left-right self-placement was measured on a ten-point rating scale, so its maximal effect on the logit is 4.7 points. Maximal effects paint a somewhat unrealistic picture since few voters hold extreme attitudes, but even if one considers the more conservative interquartile range of 1 point (dissatisfaction) and 3 points (ideology), it is obvious that political dissatisfaction and political leanings have significant and rather dramatic effects on the propensity to vote for the ER even when they are mutually controlled for. Jointly, the coefficients in the upper panel of table 1 provide fresh evidence from a large number of political contexts that the ER vote is not based on protest alone, and that the ER is by no means a “catch all” that mobilizes all social groups in a similar way (Mayer and Perrineau 1992; see van der Brug and Fennema 2003 for a broader discussion). Rather, the ER’s success is based on its appeal to a constituency that has a distinct social and attitudinal profile. This picture is complemented by th coefficients for the contextual variables, which are presented in the middle panel of table 1. “Disproportionality” and “decentralization” refer to the Gallagher-Index for the most recent election and the index devised by Lijphart (1999, 189), respectively. “Asylumseekers” reflects the number of new applications for asylum status per capita,19 “unemployment” refers to the standardized unemployment rates which are supplied by the OECD, whereas “unemployment benefits” reflects the impact of the OECD’s “Gross Unemployment Benefit Replacement Rates”.20 Three multiplicative interaction terms were created to reflect the hypotheses that the effects of unemployment and immigration reinforce each other (Golder, 2003b), while unemployment benefits can mitigate these effects (Swank and Betz, 2003). “Toughness” (the most radical position on these issues taken by any party that is not considered to be part of the ER), “salience”, “variance” and the interaction of the latter two reflect information on party competition and political elite messages in a given context and were constructed as outlined above.21 To ease the interpretation and to reduce the likelihood of numerical problems, the unemployment, asylum and benefit rates as well as the measures for salience and variance were centered at their respective grand mean. The number of asylum seekers, unemployment rates,23 and the salience of the ER’s issues, however, all seem to have substantial and statistically significant effects on support for the ER. But in the presence of interaction terms, the size and statistical significance of these main effects must be calculated conditionally. The estimated effect for the number of asylum seekers, for instance, refers to a situation where both the centered unemployment rate and the centered level of unemployment benefits are held constant at a level of 0, i.e. at the mean of the original variables. Similarly, the positive effect of the unemployment rate is conditional on average levels of immigration and unemployment benefits. 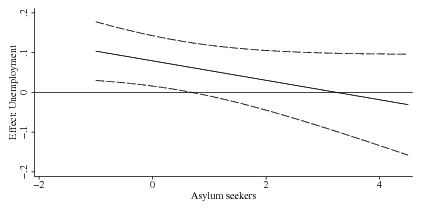 Contrary to predictions derived from ethnic competition theory, and contrary to Golder’s (2003b) findings that are based on a different specification and on macro data alone, the interaction between levels of unemployment and immigration is negative: at higher-than-average levels of asylum applications and unemployment, the effects of both variables do not reinforce each other. Rather, a ceiling effect is observed that limits the impact of both contextual variables on the ER’s support. More specifically, if immigration is very high, unemployment does not matter any more. This is illustrated in Figure 1: at levels of immigration that are slightly higher than average (> 0.7), the effect of unemployment is not longer significantly different from zero (upper panel). Since the distribution of asylum application rates is right-skewed, this applies to roughly 20 per cent of all contexts. Note, however, that the effect of unemployment is rather weak even where immigration is at its empirical minimum of -0.98. Immigration, on the other hand, has a significantly positive effect even when unemployment is up to five points above its average (lower panel). This threshold is only exceeded in ten per cent of all contexts. Similarly, more generous income replacement rates will reduce the effect of unemployment by a small and the effect of immigration by a considerable amount, as indicated by the two negative interaction effects. Moreover, unemployment benefits have an additional effect of their own, but this effect is small and statistically insignificant at average levels of immigration and unemployment. Even if unemployment and immigration rates are at their empirical extrema, this main effect will hardly effect the outcome. The interpretation of the effects that political messages sent by other parties have on support for the ER is more straightforward. In line with Arzheimer and Carter, “toughness”, i.e. the ideological position of the most radical amongst the established parties, has no significant effect. This constitutes prima facie evidence against the “conspiracy of silence” hypothesis derived from spatial models of voting. However, the two variables that reflect ideas of agenda setting and priming do have an effect. At an average level of variation in the party positions, a greater salience of the ER’s issues in the party manifestos is ceteris paribus related to a higher level of ER support. This effect (which prevails though objective factors like immigration and unemployment are controlled for) is quite pronounced: The interquartile range of the salience variable is 6.3, which translates into a change of 0.77 points on the logistic scale. This is roughly equivalent to the individual-level effect of being dissatisfied with European Integration. 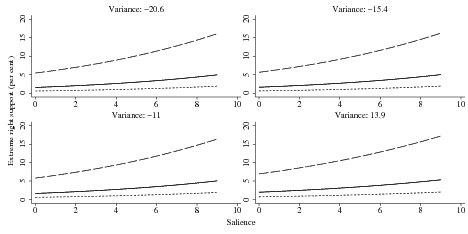 The effect of salience is somewhat muted at higher levels of variation in the party statements as indicated by the negative sign of the interaction term, but even where the (centered) variance is higher than 50, the coefficient is significantly positive, as can bee seen from the lower panel of Figure 2. This applies to more than 95 per cent of all contexts. In fact, for 90 per cent of all contexts, the variance falls into the interval [-14.1; 36.6], implying that very often the negative interaction has no substantive consequences at all and the effect of salience prevails. The effect of variance, on the other hand, is neither statistically nor substantively significant, regardless of the level of salience. While logit coefficients convey the direction of the effects and provide a means for testing their statistical significance, they are less useful for assessing the political relevance of a given variable. Here, the most relevant quantity is the predicted effect on the ER’s share of the votes, which depends on the respective level of all independent variables. A convenient tool for illustrating this impact are figures which plot the predicted probability as a function of one to three focal independent variables while all other independent variables are held constant at pre-specified levels that represent theoretically interesting “scenarios” (King, Tomz and Wittenberg, 2000). More recently, Mitchell and Chen (2005) have suggested that for complicated models, one could aggregate the average individual effects of all independent variables that are not varied in the graph into a single quantity which they dub “covariate contribution”. A relatively small number of covariate contributions (say three) could then be employed to cover a whole host of different “scenarios”. This method is used in Figure 3 to illustrate the joint effect of unemployment rates, immigration, and unemployment benefits on the probability of a vote for the extreme right. Covariate components were obtained by calculating the logit for each of the 174,452 respondents from the fixed effects in the leftmost column of Table 1 and subtracting the joint impact of the three contextual variables and their interactions from this quantity. Then, the covariate contribution was set to the fifth, seventh, and ninth decile of its distribution. Levels of immigration and levels of unemployment benefits were set to the first, the fourth, the sixth, and to the ninth decile of their respective empirical distributions, while the unemployment rate was varied from its first to its ninth decile. Figure 3 clearly demonstrates that while the effects of those three contextual variables that feature most prominently in previous research are statistically significant, their political relevance will often be negligible. The short-dashed lines that represent the lower half of all the individually calculated covariate contributions are basically flat, which indicates a trivial relationship between unemployment figures and the probability of a vote for the ER. 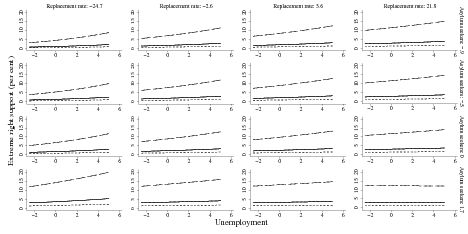 Moreover, unemployment benefits and immigration levels hardly affect support for the ER, although weak effects are discernible if one compares the graphs within the same row or same column: support is minimal where benefits and immigration figures are close to their minimum (upper left corner), but increases very slightly (by less than two percentage points) where either of the two variables comes closer to its maximum. If the contribution of other covariates is set to a somewhat higher level as represented by the solid lines, unemployment rates, unemployment benefits and immigration have a slightly stronger but rather complex effect on the predicted support for the extreme right. Comparing the graphs within each column reveals that higher levels of immigration are related to higher levels of ER support, although the differences are still small. Higher levels of benefits are related to higher levels of support, too, but this effect is restricted to contexts with below-average levels of immigration (the first two rows of graphs). As regards the effect of unemployment rates, a positive effect becomes visible, but only in contexts where either levels of immigration or unemployment benefits are very low. Most interestingly and in line with the findings by Swank and Betz, at high levels of immigration, unemployment benefits reduce the impact of unemployment, i.e. the line that represents this relationship is flat. Finally, if the contribution of other covariates is set to a very high level (that could be due to individual-level effects, a strong unit-effect, the impact of other contextual variables or a large and positive random shock at the contextual level), the three contextual variables will have a strong and intertwining effect on the probability of a vote for the ER. Basically, a comparison within the columns of Figure 3 reveals that higher levels of immigration are associated with higher support for the extreme right. This effect, however, is much stronger where the level of welfare state protection is average or below average. At higher levels of unemployment benefits, the impact of immigration is much reduced. On the other hand, unemployment benefits are positively related to higher levels of support where immigration is low (c.f. the first two rows of Figure 3). Finally, unemployment figures are often strongly related to support for the ER, but where immigration is high, this relationship effectively vanishes, which reflects the lack of the positive interaction posited by Golder (2003b). Analyzing the impact of party positions involves only two variables and their interaction and is therefore simpler. Figure 4 graphs the relationship between the salience of the ER’s issues in other parties’ manifestos and the expected vote share of the ER for four levels of variance in party statements and three levels of covariate contributions. As one would expect from the coefficients in Table 1 and the graphical analysis in Figure 2, the variance of party statements has very little impact on the success of the ER. The salience of the statements, however, is highly relevant for the ER’s electoral success, provided that the contribution of other covariates is large. For the lower 50 per cent of all covariate contributions, even very high levels of salience hardly increase the ER’s electoral fortunes, and at the seventh decile, the differences between high- and low-salience contexts are still small. If the contribution of other covariates falls into the upper third of its distribution, however, the political effect of salience is huge. While the relationship between support for the ER and the contextual variables is much more complex than suggested by previous research, the basic results of the graphical analysis can be easily summarized. First, in line with theories of ethnic competition, the ER will benefit from high levels of immigration and unemployment, but this effect is moderated by the institutions of the welfare state. Generous unemployment benefits seem to curb the additional impact of unemployment where immigration levels are high. On the other hand, if immigration levels are very low, generous unemployment benefits increase the probability of an ER vote. Accordingly, the lowest levels of ER support are predicted for a system with minimal benefits, low unemployment rates, and minimal immigration. Extreme right mobilization would be most facilitated by high unemployment and high levels of either immigration or unemployment benefits (but not both). Independent of these objective social and economic conditions, political factors, i.e. the salience of the ER’s issues in the manifestos of other parties have a remarkable effect on the ER’s prospects. Second, while these findings are of both political and theoretical interest, they apply only to a situation where the probability of an ER vote is already rather high due to other factors. For roughly 70 per cent of all covariate constellations, the contextual variables will have a small impact on the probability of a ER vote whereas for the remaining 30 per cent, contextual factors can tip the balance and can make an ER vote much more (or much less) likely. Third, a considerable portion of the covariate contributions is due to country-specific intercepts and context-specific random effects. Consequentially, the political relevance of the contextual variables will be more pronounced (1) within sub-groups that exhibit disproportionate levels of support for the extreme right (e.g. politically dissatisfied right-leaning workers) but (2) also more generally in countries where the propensity of an ER is rather high across the board (Austria, Belgium, France, Denmark, Norway), and (3) in contexts that are affected by a substantial random shock (e.g. a media scare). The substantive implications of this latter possibility should not be underestimated: from the distributional assumption in Equation ?? and the parameter estimate of 0.3 in Table 1, it follows that roughly 35 per cent of all random shocks will shift the logit of an ER vote for all citizens in a given context by at least 0.5 points upwards or downwards. If a case is near the median of the covariate contributions, a difference of that size can render contextual variables politically relevant or irrelevant. This paper set out from the twin question of why support for the ER varies so much across time and political systems. More specifically, its aim was to assess the impact of contextual variables on the support for the parties of the ER in Western Europe. The analyses presented here differ from previous accounts in two crucial ways:(1) The effects of individual and contextual variables are modeled jointly and(2) all relevant and available Eurobarometer data sets were included, resulting in maximal spatial and temporal coverage. The findings on the individual level largely confirm previous results from national studies: The ER’s electorate has a clear social and attitudinal profile. These results rule out explanations that link the ER’s electoral appeals solely or chiefly on “protest”. The picture at the contextual level is more complex. First, there is no empirical support for the “conspiracy of silence” hypothesis. On the contrary: in line with theories of agenda setting and priming, the salience of the ER’s issues (immigration and national identity) in the manifestos of the established parties has a strong positive impact, whereas the “toughness” of the established parties has no significant effect. Second, both unemployment rates and immigration have generally a positive impact on the ER vote, but their respective effects do not reinforce each other. Rather, a ceiling effect is observed. Moreover, unemployment benefits can reduce support for the ER in certain constellations. Third, the political relevance of these effects crucially depends on the contribution of other covariates. Often, even constellations of contextual variables that clearly favor the ER will be of little political consequence. Finally, even after differences in the composition of societies (via individual-level variables), features of the context, and random variation at the contextual level are taken into account, there are striking differences between countries as revealed by the estimates for the unit effects ranging from -8.7 to -3.2 points on the logistic scale. Put differently, given the levels of the variables included in the model, in Austria, Italy and Denmark the ER is persistently much stronger and in Spain, Sweden, and Finland, it is much weaker than one would expect it to be. Future research should focus on factors such as access to the media, organisational strength of the ER and links with other actors, political culture, and elite cues other than those in manifestos to come up with an explanation for these differences. Adorno, Theodor W., Else Frenkel-Brunswik, Daniel J Levinson and R. Nevitt Sanford. 1950. The Authoritarian Personality. New York: Harper. Arzheimer, Kai and Elisabeth Carter. 2006. “Political Opportunity Structures and Right-Wing Extremist Party Success.” European Journal of Political Research 45:419–443. Bale, Tim. 2003. “Cinderella and Her Ugly Sisters. The Mainstream and Extreme Right in Europe’s Bipolarising Party Systems.” West European Politics 26:67–90. Berk, Richard A., Bruce Western and Robert E. Weiss. 1995. “Statistical Inference for Apparent Populations.” Sociological Methodology 25:421–458. Boomgaarden, Hajo G. and Rens Vliegenthart. 2007. “Explaining the rise of anti-immigrant parties: The role of news media content.” Electoral Studies 26:404–417. Dollard, John, Leonard W. Doob, Neal E. Miller, O.H. Mowrer and Robert R. Sears. 1939. Frustration and Aggression. New Haven, London: Yale University Press. Duch, Raymond M. and Randy Stevenson. 2005. “Context and the Economic Vote. A Multilevel Analysis.” Political Analysis 13:387–409. Eatwell, Roger. 2004. The Extreme Right in Britain. The Long Road to ’Modernization’. In Western Democracies and the New Extreme Right Challenge, ed. Roger Eatwell and Cas Mudde. Routledge pp. 62–79. Enelow, James M. and Melvin J. Hinich. 1984. The Spatial Theory of Voting. An Introduction. Cambridge, London, Melbourne: Cambridge University Press. Esses, Victoria M., Lynne M. Jackson and Tamara L. Armstrong. 1998. “Intergroup Competition and Attitudes Toward Immigrants and Immigration. An Instrumental Model of Group Conflict.” Journal of Social Issues 54:699–724. Freeman, Gary P. 1998. The Decline of Sovereignty? Politics and Immigration Restriction in Liberal States. In Challenge to the nation-state: Immigration in Western Europe and the United States, ed. Christian Joppke. Oxford University Press pp. 86–109. Gidengil, Elisabeth, Matthew Hennigar, AndrE Blais and Neil Nevitte. 2005. “Explaining The Gender Gap in Support for the New Right: The Case of Canada.” Comparative Political Studies 38(10):1171–1195. Golder, Matt. 2003a. “Electoral Institutions, Unemployment and Extreme Right Parties. A Correction.” British Journal of Political Science 33:525–534. Golder, Matt. 2003b. “Explaining Variation in the Success of Extreme Right Parties in Western Europe.” Comparative Political Studies 36:432–466. Hox, Joop. 2002. Multilevel Analysis. Techniques and Applications. Mahwah: Lawrence Erlbaum. Ignazi, Piero. 2003. Extreme Right Parties in Western Europe. Oxford u. a.: Oxford University Press. Jackman, Robert W. and Karin Volpert. 1996. “Conditions Favouring Parties of the Extreme Right in Western Europe.” British Journal of Political Science 26:501–521. Kinder, Donald R. and David O. Sears. 1981. “Prejudice and Politics. Symbolic Racism vs. Racial Threats to the Good Life.” Journal of Personality and Social Psychology 40:414–431. King, Gary, Michael Tomz and Jason Wittenberg. 2000. “Making the Most of Statistical Analysis. Improving Interpretation and Presentation.” American Journal of Political Science 44:341–355. Klingemann, Hans-Dieter, Andrea Volkens, Judith Bara, Ian Budge and Michael D. McDonald. 2006. Mapping Policy Preferences II. Comparing 24 OECD and 24 CEE Countries, 1990-2003. Oxford u.a. : Oxford University Press. Knigge, Pia. 1998. “The Ecological Correlates of Right-Wing Extremism in Western Europe.” European Journal of Political Research 34:249–279. Kriesi, Hanspeter, Ruud Koopmans, Jan-Willem Duyvendak and Marco G. Giugni. 1992. “New Social Movements and Political Opportunities in Western Europe.” European Journal of Political Research 22:219–244. Lijphart, Arend. 1999. Patterns of Democracy. Government Forms and Performance in Thirty-Six Countries. New Haven: Yale University Press. Lipset, Seymour M. and Reinhard Bendix. 1951. “Social Status and Social Structure. A Re-Examination of Data and Interpretations. II.” British Journal of Sociology 2(3):230–254. Lubbers, Marcel, Mérove Gijsberts and Peer Scheepers. 2002. “Extreme Right-Wing Voting in Western Europe.” European Journal of Political Research 41:345–378. Mayer, Nonna and Pascal Perrineau. 1992. “Why Do They Vote for Le Pen?” European Journal of Political Research 22:123–141. Minkenberg, Michael. 2001. “The Radical Right in Public Office. Agenda-Setting and Policy Effects.” West European Politics 24(4):1–21. Mitchell, Michael N. and Xiao Chen. 2005. “Visualizing Main Effects and Interactions for Binary Logit Models.” The Stata Journal 5:64–82. Norris, Pippa and Christopher Wlezien. 2005. “Introduction: The Third Blair Victory: How and Why?” Parliamentary Affairs 58(4):657–683. OECD. 1992, 1999, 2001. Trends in International Migration. SOPEMI. Paris: OECD. OECD. 2004. Quarterly Labour Force Statistics (no. 4). Paris: OECD. Parsons, Talcott. 1942. “Some Sociological Aspects of the Fascist Movements.” Social Forces 21:138–147. Pettigrew, Thomas F. 2002. Summing Up: Relative Deprivation as a Key Social Psychological Concept. In Relative Deprivation. Specification, Development, and Integration, ed. Iain Walker and Heather J. Smith. Cambridge: Cambridge University Press pp. 351–373. Schmitt, Hermann, Evi Scholz, Iris Leim and Meinhard Moschner. 2002. The Mannheim Eurobarometer Trendfile 1970-2002. Data Set Edition 2.00. Codebook and Unweighted Frequency Distributions. Updated by Iris Leim and Meinhard Morschner, ZA Cologne. http://www.za.uni-koeln.de/data/en/eurobarometer/eb_trends/eb_trends_1970-2002_cod.pdf: Zentralarchiv für Empirische Sozialforschung. Sherif, Muzafer and Carolyn W. Sherif. 1953. Groups in Harmony and Tension. An Integration of Studies on Intergroup Relation. New York: Harper and Brothers. Svåsand, Lars. 1998. Scandinavian Right-Wing Radicalism. In The New Politics of the Right. Neo-Populist Parties and Movements in Established Democracies, ed. Hans-Georg Betz and Stefan Immerfall. Houndmills, London: Macmillan pp. 77–93. Swank, Duane and Hans-Georg Betz. 2003. “Globalization, the Welfare State and Right-Wing Populism in Western Europe.” Socio-Economic Review 1:215–245. Swyngedouw, Marc. 2001. “The Subjective Cognitive and Affective Map of Extreme Right Voters: Using Open–ended Questions in Exit Polls.” Electoral Studies 20:217–241. Tajfel, Henri, M.G. Billig, R.P. Bundy and Claude Flament. 1971. “Social Categorization and Intergroup Behaviour.” European Journal of Social Psychology 1:149–178. Tarrow, Sidney. 1996. Power in Movement. Social Movements, Collective Action, And Politics. Cambridge: Cambridge University Press. Thränhardt, Dietrich. 1995. “The Political Uses of Xenophobia in England, France and Germany.” Party Politics 1:323–345. UNHCR. 2002. 2002 UNHCR Statistical Yearbook. http://www.unhcr.org/cgi-bin/texis/vtx/template?page=home&src=static/statistical_yearbook/2002/toc2.htm: United Nations High Commissioner for Refugees. van Buuren, Stef and Karin (CGM) Oudshoorn. 1999. Flexible Multivariate Imputation by MICE. http://web.inter.nl.net/users/S.van.Buuren/mi/docs/rapport99054.pdf (07.10.2005): TNO Prevention and Health. van der Brug, Wouter and Meindert Fennema. 2003. “Protest or Mainstream? How the European Anti-Immigrant Parties Developed into two Separate Groups by 1999.” European Journal of Political Research 42:55–76. Weakliem, David L. 2002. “The Effects of Education on Political Opinions. An International Study.” International Journal of Public Opinion Research 14:141–157. Winkler, Jürgen R. 1996. Bausteine einer allgemeinen Theorie des Rechtsextremismus. In Rechtsextremismus. Ergebnisse und Perspektiven der Forschung. PVS Sonderheft 27, ed. Jürgen W. Falter, Hans-Gerd Jaschke and Jürgen R. Winkler. Opladen: Westdeutscher Verlag pp. 25–48. Yonwin, Jessica. 2004. Electoral performance of far–right parties in the UK: Standard Note: SN/SG/1982. http://www.parliament.uk/commons/lib/research/notes/snsg-01982.pdf: House of Commons Library. Zaller, John R. 1992. The Nature and Origin of Mass Opinion. Cambridge, New York, Oakleigh: Cambridge University Press. (b) Effect of immigrationGraphs are based on estimates in Table 1. Both variables are centered. 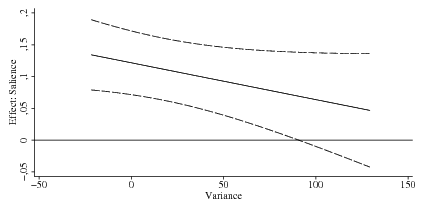 95% confidence interval calculated with Variance-covariance matrix estimated under listwise deletion. The level of unemployment benefits is set to its mean of zero. 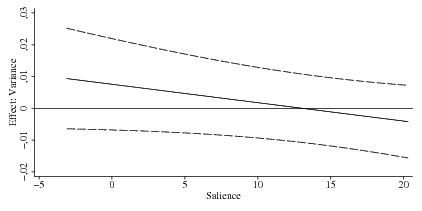 (b) Effect of salienceGraphs are based on estimates in Table 1. Both variables are centered. 95% confidence interval calculated with Variance-covariance matrix estimated under listwise deletion. The level of unemployment benefits is set to its mean of zero. Graphs are based on estimates in Table 1 (listwise deletion). All variables are centered. Covariate components set to -4.7 (short dash), -3.8 (solid line), and -2.3 (long dash). Graphs are based on estimates in Table 1. Both variables are centered. Covariate components set to -5 (short dash), -4 (solid line), and -2.7 (long dash). Logistic multi-level model. PQL2 estimates, model-based standard errors in parentheses. MI results based on eleven separate imputations. *I wish to thank Paul Whiteley for advice and comments. I am also indebted to the participants of staff seminars at Essex and Mainz and to Elisabeth Carter, Jocelyn Evans and Chris Wendt for helpful comments at various stages of this research project. 1Much of the early literature is devoted to the perhaps not entirely fruitful twin debates on the “correct” label and on criteria for membership in this party family. However, at least the latter question is more or less settled since the mid-1990s: “we know who they are, even though we do not know exactly what they are” (Mudde 1996, 233, see also note 11). As regards terminology, this article refers to the “extreme right” because this seems to be the most commonly used label in recent research. 2On the other hand, theories of authoritarianism and anomia provide very limited analytical leverage because they focus on largely stable psychological states. Therefore, it is difficult to see how they could explain short-term fluctuations of ER support within a given country or persistent differences between otherwise largely similar countries. 3Jackman and Volpert analyze 103 elections that were held in 16 countries between 1970 and 1990. 4The relatively small Christian Social Union in Germany is a point in case: while they are clearly positioned in the political mainstream and have always formed an alliance with the much larger Christian Democratic Union at the national level, they take a tougher stand on immigration than the “Post-Fascist” Italian National Alliance (Lubbers, Gijsberts and Scheepers, 2002). 5According to Zaller, this effect is moderated by the political awareness of the respondents. In principle, the role of political awareness could be modeled by a cross-level interaction. However, since data on political awareness is rather limited, and since this moderating effect is not central to the argument presented in this paper, this route was not pursued. 6Switzerland is excluded from the analysis both for substantial reasons as well as for a lack of data. 7The partial cumulation of the Eurobarometer produced by a team led by Hermann Schmitt (Schmitt et al., 2002) greatly facilitated the construction of the data set. An appendix containing details of the coding and imputation procedures as well as scripts for Stata and Mlwin that can be used to replicate the findings, additional tables and an assessment of the robustness of the findings are available through the author’s dataverse at . 8Because of the economic, social, and political-cultural differences, there are separate surveys for East and West Germany. Norway did not accede the EU in 1994 but did participate in the Eurobarometer between 1990 and 1996 and then again in 2002/2003. 9Luxembourg had to be excluded because the OECD does not calculate standardized benefit rates for this country. Estimates for a number of more parsimonious models that are based on a larger number of respondents and contexts including Luxembourg are presented in the online appendix. 10Britain is a case in point. In 2005, the British National Party, now the most important party of the ER in the United Kingdom (Eatwell, 2004), contested 119 of the 646 Westminster constituencies, i.e. less than 20 per cent (Norris and Wlezien, 2005, 678). With 57 and 33 candidates, the numbers were even lower in 1997 and 2001 (Yonwin, 2004, 7). 11The variable is coded as 1 if an respondent intends to vote for the Freedom Party in Austria, the Front National or the Vlaams Blok in Belgium, the Freedom Party or the Danish People’s Party in Denmark, the Rural Party or the True Fins in Finland, the National Front in France, the German People’s Union, Republikaner or National Democrats in Germany, the EPEN, the National Front and Political Spring in Greece, the National Alliance and the Northern League in Italy, the Center Parties and the Lijst Pim Fortuyn/Leefbar Nederland in the Netherlands, the Freedom Party in Norway, the “Christian Democrats” in Portugal, the various Falange Parties in Spain, and New Democracy in Sweden. Voters of other parties and self-declared non-voters are coded as 0. 12To simplify the presentation, the model contains no constant but rather one unit-dummy for each country. 13Note that a double index indicates variation both across persons and contexts, while variables with a single index vary across contexts but are constant over persons within the same context. 14More explicitly, the Variance-Covariance Matrix Ωu that governs the distribution of u0j is assumed to be a diagonal matrix whose elements are identical. 15AT = Austria, BE = Belgium, DE-E = East Germany, DE-W = West Germany, DK = Denmark, ES = Spain, FI = Finland, FR = France, GR = Greece, IT = Italy, NL = Netherlands, NO = Norway, PT = Portugal, SE = Sweden. 16If one considers a shock of 0.7 points on the logistic scale (which is equivalent to the effect of Euroscepticism) as “large”, this threshold will be exceeded in about 20 per cent of all realizations. 17All socio-demographic variables enter the model as dummy indicators. 18Euroscepticism is measured by a dummy variable. 19Other figures such as the number of non-white residents or the share of foreign-born residents could have been employed, too, but the data on asylum seekers and refugees are preferable for at least three reasons: first, asylum applications (and family reunification claims, which are often related to previous applications) have provided the main route for new legal immigration into Wester Europe since the 1970s (Freeman, 1998, 94), second, unlike other measures they are comparable across time and countries, and third, asylumseekers and refugees have become the main focus of the ER’s propaganda. To prevent numerical problems, the numbers were entered as applications per 1,000 residents. 20The OECD calculates “Gross Unemployment Benefit Replacement Rates” by averaging over several types of households, durations of unemployment, and income levels before unemployment. 21Parties of the ER were excluded from all calculations. For salience and variance, the figures were weighted according to the relative size (vote share) of the respective parties. Since the party manifestos are usually published only when an election is imminent, party positions between publication dates were interpolated. 22Removing France from the sample does not substantively affect the results. 23The individual employment is controlled for.